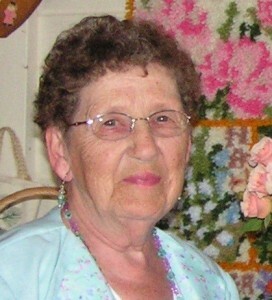 Elma G. Marshall, 85, DeKalb Junction, died, August 1, 2012, at Claxton Hepburn Medical Center, Ogdensburg. Calling hours will be Friday, August 3rd, 6 – 8 PM, the funeral service will be Saturday, August 4th, 11:00 am at the Old DeKalb Methodist Church, Old DeKalb,Reverend William Masters officiating, burial will follow in Hillcrest Cemetery, Heuvelton. Elma is survived by her son, Dean and Linda Marshall, Heuvelton, daughter Carol and James Moore, Michigan, a brother, Stanley Holland, Lorraine, sisters June Gabriel, Rochester, and Dorothea Redmond, Arizona, grandchildren, Michael Marshall, Ogdensburg, Gregory Moore, Michigan, Matthew Moore, Wisconsin, Sean and Amalia Moore, Wisconsin, several nieces and nephews. She was predeceased by brothers, Clyde, David and James Holland, sisters, Helen Weegar and Ruth Payne. Elma was born on July 14, 1927 in the Town of DeKalb, the daughter of David and Pearl Weatherup Holland. She graduated from Gouverneur High School and then attended A. Barton Hepburn Hospital School of Nursing, receiving her registered nursing degree. Elma married Dean Marshall on April 3, 1949 in the Town of DeKalb; he predeceased her in December 1977. Elma started her career in pediatric nursing and then became the head nurse in the operating room at A. Barton Hepburn Hospital, she worked for Dr. Whitmyer in Ogdensburg, and she then became the head nursing administrator at Cedar’s Nursing Home, her last position before retirement was a nurse for St. Lawrence County Public Health in Canton. She was a member of the Old DeKalb Methodist Church, the Order of the Eastern Star in Heuvelton, and the DeKalb Historical Association. Elma enjoyed rug hooking and Facebook. Contributions can be made to American Cancer Society or the Old DeKalb Methodist Church. My sincere sympathy to the family. Elma was one of the greatest nurses I ever worked with and a great lady! My sincerest sympathies to Carol and Dean and your families, your lose touches us all. Aunt Elma will be greatly missed. Elma was the best “adopted Mom” a girl could ever have. Over the years, the memories of all your family did for me has come to my mind many,many times.Elma was my Mom for several school events that required a Mom to be present.She was such a kind person, as was your whole family. Some memories become lost over time, others remain with a person forever. I have three memories that have always stayed with me – 1.) I was baking a chocolate birthday cake for one of your birthdays. I didn’t know how to start the gas oven and I left the gas valve open too long trying to start it. When I finally got the match to the valve (I didn’t know how to light matches, either), the gas had built up and it exploded in my face. I was so scared I ran home screaming to my own mom that my hair was on fire. Of course, it wasn’t but I was not to be convinced. After a few minutes with my mom, I was able to go back to your house. I don’t think I finished the cake, though. 2) Your Mom acted as my Mom for several dinners and award banquets at school even though I was not receiving awards. 3.) Once I stayed overnight at your house as a guest after you got old enough to stay alone because I missed you guys so much. Your Mom still looks very much as she did when we lived across the road and up a bit. She is just as beautiful as ever. I can see the inner beauty that glows from the inside out when I look at her picture. I have been very fortunate indeed to have had 2 wonderful Moms in my life – my own and yours, too. Please take care and know your Mom is watching over you, still.